A tool for removing oil in submerged vessels was developed in Norway by Miko Marine. Moskito is designed to address the pollution threat that exists with the large numbers of sunken ships around the world that still contain significant quantities of oil in their tanks as cargo or bunker fuel. Many of the thousands of ships sunk during WWII now have seventy years of corrosion eating at their plates and the days are drawing closer when the pollutants could escape. 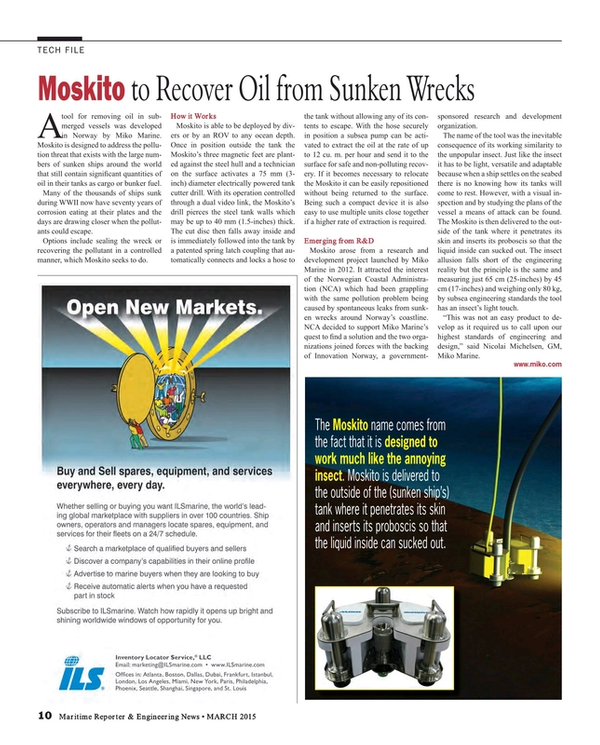 Options include sealing the wreck or recovering the pollutant in a controlled manner, which Moskito seeks to do. Moskito is able to be deployed by divers or by an ROV to any ocean depth. Once in position outside the tank the Moskito’s three magnetic feet are planted against the steel hull and a technician on the surface activates a 75 mm (3-inch) diameter electrically powered tank cutter drill. With its operation controlled through a dual video link, the Moskito’s drill pierces the steel tank walls which may be up to 40 mm (1.5-inches) thick. The cut disc then falls away inside and is immediately followed into the tank by a patented spring latch coupling that automatically connects and locks a hose to the tank without allowing any of its contents to escape. With the hose securely in position a subsea pump can be activated to extract the oil at the rate of up to 12 cu. m. per hour and send it to the surface for safe and non-polluting recovery. If it becomes necessary to relocate the Moskito it can be easily repositioned without being returned to the surface. Being such a compact device it is also easy to use multiple units close together if a higher rate of extraction is required. Moskito arose from a research and development project launched by Miko Marine in 2012. It attracted the interest of the Norwegian Coastal Administration (NCA) which had been grappling with the same pollution problem being caused by spontaneous leaks from sunken wrecks around Norway’s coastline. NCA decided to support Miko Marine’s quest to find a solution and the two organizations joined forces with the backing of Innovation Norway, a government-sponsored research and development organization. The name of the tool was the inevitable consequence of its working similarity to the unpopular insect. Just like the insect it has to be light, versatile and adaptable because when a ship settles on the seabed there is no knowing how its tanks will come to rest. However, with a visual inspection and by studying the plans of the vessel a means of attack can be found. The Moskito is then delivered to the outside of the tank where it penetrates its skin and inserts its proboscis so that the liquid inside can sucked out. The insect allusion falls short of the engineering reality but the principle is the same and measuring just 65 cm (25-inches) by 45 cm (17-inches) and weighing only 80 kg, by subsea engineering standards the tool has an insect’s light touch. “This was not an easy product to develop as it required us to call upon our highest standards of engineering and design,” said Nicolai Michelsen, GM, Miko Marine.